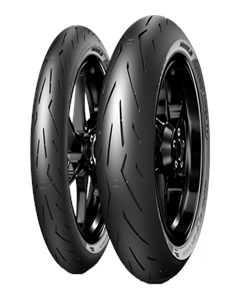 DIABLO ROSSO CORSA II, Pirelli's first multi-compound motorcycle tyre transferring racetrack performance into street versatility. Bicompound solution for the front tyre — applying the two compounds in three different zones. Triple compound on the rear distributed in five zones. New the tread pattern design.